Senate Judiciary Committee Chairman Chuck Grassley, R-Iowa, left, accompanied by Sen. Dianne Feinstein, D-Calif., the ranking member, center, speaks with Sen. Patrick Leahy, D-Vt., right, during a Senate Judiciary Committee markup meeting on Capitol Hill, Thursday, Sept. 13, 2018, in Washington. The committee will vote next week on whether to recommend President Donald Trump's Supreme Court nominee, Brett Kavanaugh for confirmation. Republicans hope to confirm him to the court by Oct. 1. WASHINGTON — The top Democrat on the Senate Judiciary Committee said Thursday that she received a letter from a person about Supreme Court nominee Brett Kavanaugh and referred it to federal investigators. “Throughout his confirmation process, Judge Kavanaugh has had 65 meetings with senators — including with Senator Feinstein — sat through over 30 hours of testimony, addressed over 2,000 questions in a public setting and additional questions in a confidential session. Not until the eve of his confirmation has Sen. Feinstein or anyone raised the specter of new ‘information’ about him,” said spokeswoman Kerri Kupec. A person familiar with the matter confirmed that the letter was referred to the FBI. The Justice Department declined to comment, and Kavanaugh did not immediately respond to a request for comment. 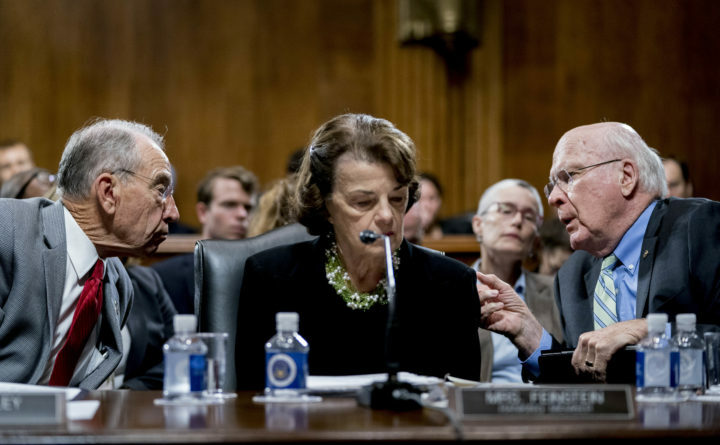 Feinstein did not disclose the contents of the letter when pressed on Thursday and Senate Judiciary Committee Chairman Chuck Grassley, R-Iowa, said he had not seen it. The controversy arose in the final stages of Kavanaugh’s confirmation process, as Democrats sought to delay the process. Separately, the Judiciary Committee on Thursday delayed its vote on Kavanaugh until Sept. 20, with votes by the full Senate expected during the final week of September. Washington Post writer Amy Brittain and Matt Zapotosky contributed to this report.